A new Stealth Dragon appears for Nubatama, that heavily supports Dominate focused Decks. AUTO (RC): [Choose up to 1 card from your hand, discard it] During your turn, when a Dominated Unit attacks, you can pay the cost. If you pay it, draw 1 card, during that turn, this Unit loses this ability. AUTO GB1: When this Unit is placed on (RC), choose up to 2 of your Rear-guards and up to 1 of your opponent’s Units. During that turn, increase or decrease those Units’ Power until they become 11000. 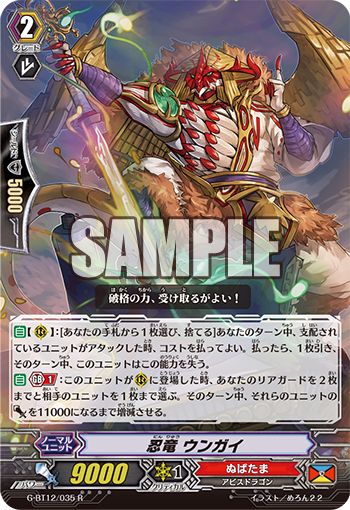 For Today’s Card, we’re introducing “Stealth Dragon, Ungai”, from the 12th Booster Pack “Dragon King’s Awakening” on sale August 25th, 2017, who is a support card for 《Nubatama》 【Dominate】 Decks. “Stealth Dragon, Ungai” is a Unit with technical abilities that can adjust the Power of ally and opponent Units. When placed on a Rear-guard Circle, you can choose 2 of your ally Rear-guards and 1 of your opponent’s Units, and its super powerful Skill makes the Power of all of those Units 11000. As a result, ally Units can attack the opponent’s Vanguard on their own with 11000 Power regardless of their original Power. Also, your opponent’s Rear-guard can have its Power raised for Dominate, making it more likely its attack will hit while Dominated! And when a Dominated Unit attacks, “Ungai” lets you discard 1 card from your hand to draw 1 card. Even if the attack doesn’t hit, you can cycle your hand, and if “Stealth Dragon, Utsuroi” is in your Drop Zone when an attack hits, “Utsuroi” can return itself to the hand, making it so you lose zero hand presence. We’ll be continuing to introduce cards from “Dragon King’s Awakening” for “Today’s Card”! Please enjoy! Q. Vs. a “Chronojet Dragon” who gained 5000 Power due to a Trigger Effect, if you use ‘Adjust until Power is 11000’ skill of “Stealth Dragon, Ungai” what will “Chronojet Dragon”‘s Power be? A. It loses 5000 Power, making it 11000. Q. If your opponent’s Vanguard is “Dragonic Overlord The End”, and your opponent has “Dragonic Overlord” in their Soul, if you use “Stealth Dragon, Ungai” and its effect on “Dragonic Overlord The End”, what does “Dragonic Overlord The End”‘s Power become? A. Its Power is reduced by 2000, making it 11000. Q. Your opponent’s Vanguard is “Black Shiver, Gavrail” and your opponent also has “Nurse of Broken Heart” as their Rear-guard. If your opponent’s achieved Generation Break 2 and there are 3 cards placed in your opponent’s Damage Zone, what is the power of “Black Shvier, Gavrail” if you use the skill of “Stealth Dragon, Ungai” against “Black Shiver, Gavrail”? A. Its Power is reduced by 12000, making it 11000. Afterwards, a card is placed in the Damage Zone, activating the skills of “Black Shiver, Gavrail” and “Nurse of Broken Heart” which changes their Power.